Just imagine where you would be if all the teachers in your life had only helped you go an inch deep into your learning. Great teachers help create great students. An informed teacher is the most important school-related factor influencing student achievement, so it matters a lot to pay close attention to how we train and support both new and experienced educators. This has been a call for a seminar on new approach to teaching. 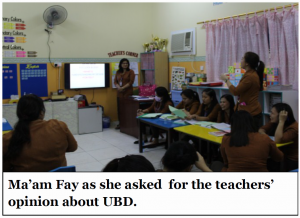 A seminar on UBD (Understanding By Design) was conducted last October 12 to preschool teachers and facilitated by our Department Head, Miss Phides Fay B. Cuntapay. An overview of Understanding by Design and Standards Based-Assessment was the start of the discussion. UBD has been around since 2003 and yet it is only beginning to appeal to both public and private schools just now. UBD is a new approach in a way that it focuses teachers on the outcomes of instruction instead of activities and textbooks to be used in teaching. It emphasizes on ―Teaching for Understanding‖, that is teaching not just for students to know ideas, but teaching to enable students to understand how such things are relevant in various aspects of their lives. At this time, the seven key tenets or core beliefs were discussed to help implement the framework and help students go a mile deep into their learning. The types of Standards and Curriculum were also part of the discussion. Yes! UBD is one of the best things that happened in education. And it isn’t proper to get frustrated and frantic about it.